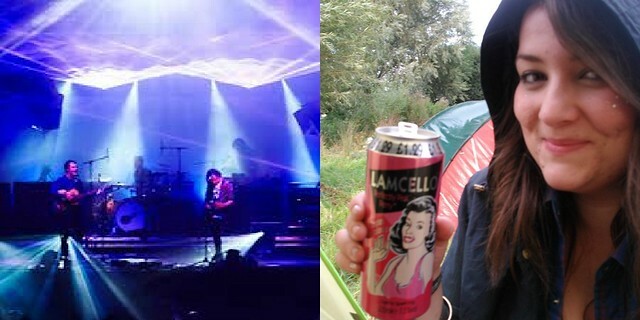 I got the coach from Cardiff on Thursday with my mates Emma and Harri (which was full of people who just got their GCSE results) and pitched up the tent in the green camping area by the G4 road where I usually camp. It's close to the site entrance and arena which is perfect for lazy people like me. We decorated the tent with some bunting which is pretty useful once you've had a few beers because all tents look the same in the dark. I spent Thursday night getting to know my camping neighbours around a campfire. I spent most of the night selling Wales as a tourist destination to Aussies, I always get so patriotic when I go away! Friday was the day that I manged to catch the most bands and acts and made sure that I got into the arena pretty early to catch the Cardiff band Future of the Left.. I caught the end of Chris Ramsay on the Alternative stage and a few other comedy acts before watching Spector and The Hives on my favourite stage, the NME/Radio1 tent which has a great atmosphere. I have seen Fred from Spector in a few bands over the years and even though he divides opinion I really like him and I was so happy to see the tent packed out for their set. Fred reminds me of Vice magazine and all the annoying things about East London types but it was pretty heartwarming to see him with a huge smile when people were singing along to all his bands catchy tunes. 'Never Fade Away' was my highlight of the set and event the stewards and event security were singing along. I saw some Alt-J on the Festival Republic stage and Kate Nash and Felix from The Maccabees were also in the crowd. The Maccabees are my favourite band at the moment and I was trying to play it cool but squealed 'OhmyGodit'sFelixfromTheMaccabees' and nearly fainted when he walked past me my mates. Such a fan girl, he has such shiny hair... swoon. I managed to cram in Bombay Bicycle Club, Graham Coxon and The Courteeners (Liam Fray was looking HOT with his new quiff) before going to see The Cure headline on the main stage. I only stuck around for a few songs because The Maccabees were headlining on the NME stage and I wasn't going to miss that for anything even a classic band like The Cure. The Maccabees set was beautiful and almost brought me to tears playing First Love, Precious Time and Can You Give It in a row. They are such a sincere band and if you get a chance to see them live you really should. Saturday was the most fun I've had in a long time. I was lucky enough to be able to have a shower in a mates hotel room, nothing beats clean hair and feeling fresh. 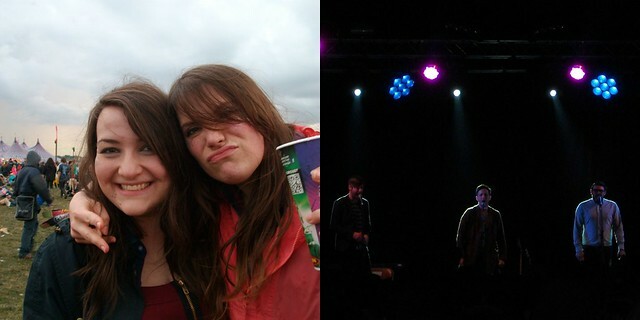 I then headed back to the festival site to watch Mystery Jets and Santigold (she was amazing!) before going to the tent for some wine. After a lot of wine from a box and perry from a can (classy) I ran into the arena for The Vaccines and proceeded to annoy about 2,000 people. I was so loud and larey running around the crowd with Harri looking for Welsh flags and spreading glitter over unsuspecting strangers and all over my hair and face. The heavens opened when Florence and the Machine came on and I got soaked. I love her but it wasn't her best set, the play list was a little dull. I preferred her in Cardiff a few months ago but she gave a great performance. Harri and I lost the rest of our group and decided to go and watch Feeder who played to a packed out tent. I loved this band so much as a teenager and it was great to see them play a set full of fan favourites. I think that watching them was the highlight of Reading for me and I had a blast dancing and singing with Harri and a few people we met from Essex. There is nowhere else in the world where I would go and see Feeder and dance with people I just met like I've known them all my life. After the excess and madness of Saturday I took a more relaxed approach to Sunday. I managed to see The Joy Formidable, Kaiser Chiefs (2004 all over again) The Black Keys, The Horrors, Two Door Cinema Club (highlight of the day) and then saw a little of all the headliners Justice, Foos and Less Than Jake. I'm so glad I went to see The Futureheads do their acapella and acoustic set, talented guys! I didn't take many photos because I was just having too much fun but I wore my Barbour jacket and wellies for most of the weekend with denim shorts and checked shirts like most people there. I'm hoping to take more festival fashion photos at Bestival and will be dressing up a bit more there. 3. 16 year olds should not wear hotpants. I do not want to see your cheeks. Ooh great post, I'm beginning to feel a bit like that about festivals, I LOVE them but at the same time crave my own bed, a shower and a proper toilet! However, I think I'm going to end in style by doing Glasto next year...hopefully. kids bloody everywhere! where do they get the money for tickets and why do they wear no clothes?! Sounds like you had such an amazing time! I would have loved to of run around spreading glitter with you haha!! Im welsh can i have some glitter :) I saw the maccabees a few months ago and they were amazing !!! Sounds like the festival was amazing ! Sounds like you had an amazing time! The last time I went to Reading I was 20 and I felt kinda old then! I was thinking about going this year but the age thing does kinda put me off (I'm 26 now). You're right about The Maccabees being a sincere band; they're the only band I've ever seen who took the time to thank the lighting guys! Ahh it sounds like you had a fabulous time! I haven't been to a festival in years. Totally agree re 16yr olds and hotpants, I keep seeing girls getting on my bus in a morning like that.. I want to shout no, just no! My thoughts on Leeds were pretty much the same! Lucky you getting a shower, I left home on Tuesday, so went without till I returned on Monday! Shocking! I definitely second you on the bum cheeks, apparently its all I talked about all weekend, but they are so distracting!